This stylish haircut has become a favorite for many men thanks to Kid ‘n Play. Whereas hair at the top is left to remain long, the sides are cut off short. Remember Tupac in the movie “Juice”? He rocked a haircut like this one; except for the fact that his was a high cut. This low version adds a bit of personality when combined with a clean curved line. This side faded cut is perfect for showing facial features like a great jawline. It shifts attention from your haircut to your face. This tampered fade cut features a high sitting afro with very clean and sharp lines. The sides are tapered to create a gradient effect, and the afro is shaped at precise angles that match the shape of your head. Do you like flat top haircuts? Try this juice fade. The tramline creates a very appealing gradient just above the part where the hair begins to fade. It is one of the best versions of the flat top haircut. This is the style for you if you don’t fancy long afro hair. The hair on the sides is cut off completely, and that on the top is left to be fairly short. You can opt for this classic juice fade style. It gives a simple yet exquisite look that can be enhanced even further by a well-shaped sideburn and beard. 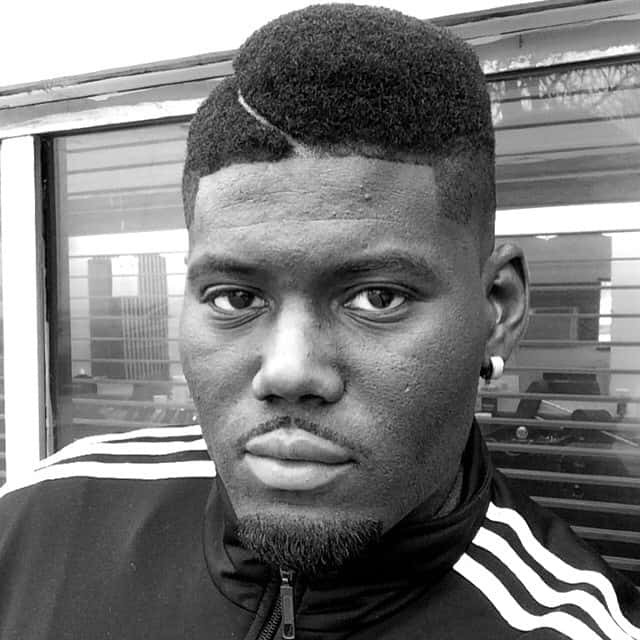 This flat top style originated from African Americans. It can either be a low or high cut. The outstanding channeling gives it an impressive gradient and thus a great resultant outlook. The most outstanding and visible feature of this haircut is its tramline. The style is perfect when you are rocking slightly short hair and a long bushy beard. That allows for tapering on the sides and thus highlighting your well-maintained beard. The low cut makes your hair very smooth and even across the whole head. The sharp cuts and curved line offer an even better and more appealing look. Will Smith made the shaped afro fade to be popular. However, modifications and variations like this one with a bleach on top made it more versatile. The trick is to cut the hair in such a way that it forms a regular dome shape. Contrary to your ordinary flat top haircut, this one features artwork that gives you and even better look. This particular cut has an arrow tramline. Note that you can always choose any other artwork that you like or one that suits you most. Just as Kanye West combines his juice fade with Aztec print, you can also do so with any other print of your choice. A well-designed print (like this one) can combine your fade style with sideburns to give you an amazing outlook. A high top design is good; a half high top is better, but a half high top that fades is definitely the best. As you can see, a tramline cuts through one side of the head to make it shorter than the other (thus making it a half high top because only one side achieves the full height). Here is yet another artistic variation of the high top. This style combines accurate lines and geometric shapes to offer a stunning haircut. If you don’t fancy the traditional juice fade, then you can modify it with this amazing style that brings art into life. The hair at the top tapers to allow that of the sides to be shaped and designed into stunning artworks. Another modification to your traditional juice fade is the addition of color. The best way to do it is by adding a color that suits your skin tone and to the un-tapered part of your hair. You can opt to have long hair on one-half of the top of your head and short hair on the other half. A clear tramline separates the two sides. 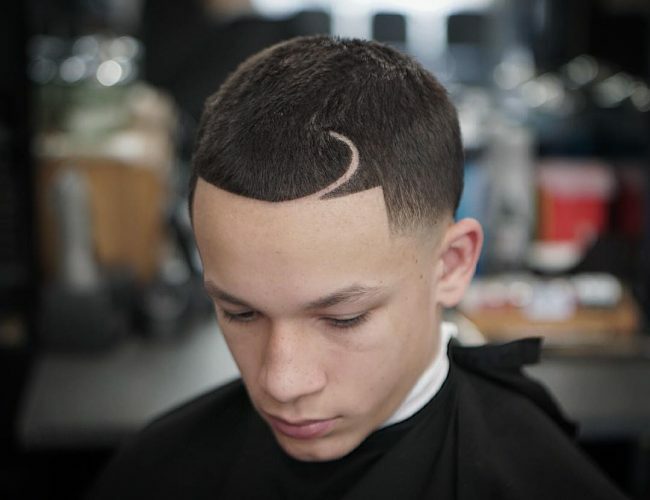 The main addition to this juice fade style is a fairly long curve line. It can run from the front to the middle or back of the head. As you can see in the image, the line can curve more than once before it ends. This flat top is a demonstration of how great you can look when you combine a high cut with a flat top at a precise angle just above the forehead. This is not your ordinary Mohawk. The top features long and curly hair while the sides are faded. The outstanding tramline adds extra umpf to the style. The flat top is combined with an edgy cut and a fade on the sides. The tapering sides allow you to incorporate designs on both sides of the head. As the name suggests, this style gives your hair a cylindrical shape. For this particular case, it is half a cylinder since one side is shorter than the other. The horizontal line adds value to the whole design. A bald usually appears when a man’s hairline recedes until his forehead loses all hair completely. Today, men rock hairstyles that "reverse" that process. Hair remains at the top and tapers at the sides so that they appear to be bald. Tired of your traditional high top? Try combining it with a tapered juice haircut. The combination results in one of the most stunning looks. With a good barber, you can pull off one of the looks very quickly and comfortably. Choose one that suits the shape of your head and rock it today for an amazing physical look.